Royal Icing is super easy to make and fun to worth with. It's not the best-tasting stuff in the world, but the decorations dry rock-hand and keep forever - and cleaning up is a dream because there's no grease or butter. 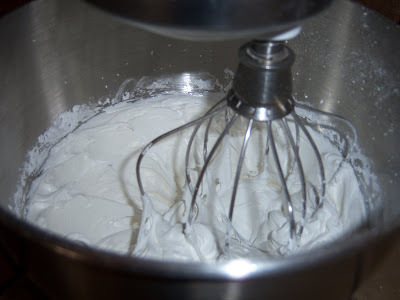 Mix the egg whites into the sugar at low speed until incorporated, then increase the mixer speed to med-high and beat for 5-7 minutes. Icing will be very stiff, and can be thinned with a little water as needed. 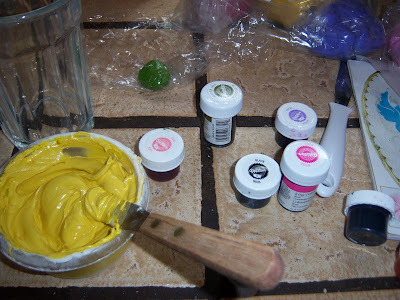 Store airtight, and keep bowls covered with a damp cloth or paper towel, the icing hardens very quickly. For the top layer, I made about 16 daffodils to arrange around the pink band in the center. 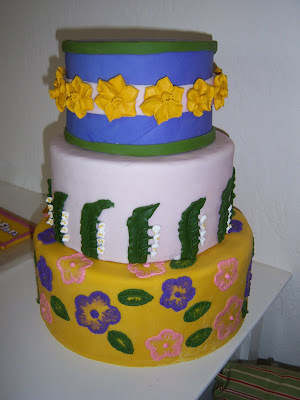 The middle layer was decorated with a row of lilies of the valley. For the bottom layer, I piped a pattern of leaves and flowers, and then used a brush embroidery technique. 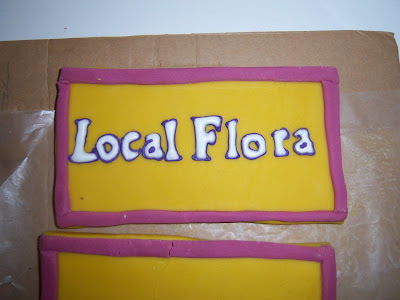 I made also made the "Local Flora" letters for the topper pieces. I printed out a photo of the sign at the size I needed and laid a sheet of wax paper over it. I outlined the letters in purple with a #1 tip, then filled it in with thinned-out white royal icing. 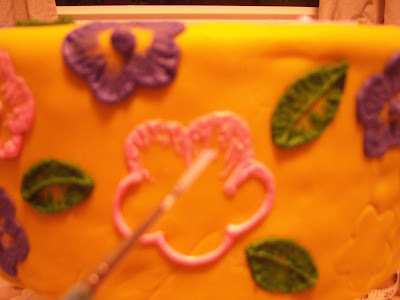 Once they're dry, they can be attached to the pieces with royal icing "glue." Other than being a little bummed that the pink fondant really, really faded (not sure why... I need to investigate this.....) I'm v. happy with how things are stacking up.